The extensive pet food recalls in 2007 caused a tremendous amount of fear and turmoil for pet parents. One piece of good news actually did surface after such a devastating event, but few people know about it. What is it, you ask? Although a small handful of the tainted pet food products were labeled as "natural," none of them were organic. It's no wonder then that sales of organic pet food continue to increase. According to the Organic Trade Association (OTA) - a "membership-based business association for the organic industry in North America" - organic pet food sales increased 63% from 2003 to 2004. Yet another 46% increase occurred in 2005, with organic pet food being the second fastest growing non-food category (surpassed only by organic flowers at 50%). The OTA predicts that such an upward trend for organic pet food sales will continue straight through 2010. As dog parents, what can we actually expect to find in our furry friend's organic food supply? Can we assume that it's completely free of toxic pesticides and insecticides, chemical preservative and additives, and artificial flavors and colors? Are the meat sources that were used hormone and antibiotic-free and were they too fed pesticide-free grains? Were the fruits and vegetables that were used also organically grown? As surprised as you might be to learn this, it's actually legal for manufacturers to label their products as "organic," even though there are no organic ingredients within it. How is that possible, you wonder? Without going into to much detail, suffice it to say that, even though the Organic Foods Production Act (OFPA) was passed back in 1990, no provisions were made that specifically pertained to pet food. Twelve years later, when the "organic seal administering" National Organic Program's (NOP) regulations and standards went into effect, organic pet food again was not addressed. As the popularity of organic pet food continued to increase, it became apparent that such a lack in definition, production standards, and package labeling had to be addressed to reduce the rampant confusion. To address such concerns and issues, the National Organic Standards Board (NOSB) created a separate Organic Pet Food Task Force (PFTF) in 2005. The 12-member PFTF panel, made up of nutrition experts, organic and "traditional" pet food suppliers, representatives from state and federal regulatory agencies, and various other professionals, has now made its recommendations pertaining to the manufacture and labeling of organic pet food. The NOSP is reviewing such proposals and it's hoped that the new standards will finally become effective sometime in 2008. Until such proposals are actually accepted and instituted, if you really want "the skinny" about them, you can check out this white paper for specific details. Refer to Pet Food Task Force for reports and associated public comments. Even though the legal definitions and related issues surrounding the manufacture and labeling of organic dog food have yet to be completely worked out, the products that are currently out there are considered to be of extremely high quality - well worth trying even before the specific regulations are finally implemented. Simply do your homework and compare lists of ingredients, just as you would for "traditional" dog foods. Some foods might contain only one or two organic items, while others are made entirely of organic ingredients. 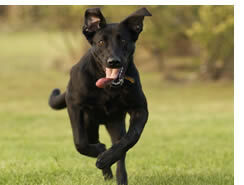 Commercially made organic food for your canine companion is currently available in a variety of forms. Hard and soft organic foods exist, as do grain-free and vegetarian ones. Raw organic diets are also possible. If you're one of the many pet owners that are now understandably leery of all manufactured foods after the recall of 2007, you might want to consider home cooking for your dog. This will obviously allow you to have the greatest amount of control over the exact organic composition of their food. Not as time consuming as many pet parents often assume, there are numerous sources of information to make the process easier - canine cookbooks and online discussion groups to name just a few. Regardless of what organic diet you choose for your beloved dog, before you make any changes, check with their veterinarian or other holistic health care practitioners about what organic foods might be best for your pooch. Your dog might have specific health issues that need to be addressed with proper nutrition and/or additional supplementation. There's no denying that the current cost of feeding an organic canine diet is more than a "non-organic" one. However, it's important to note that dog owners who do feed their canine companions organic meals often report significant improved health and greatly reduced medical bills that result from such a diet. Whether that's due to the organic food's "less toxic" nature or its' reported immune-enhancing capabilities is probably a mute point - what's good is good! You'll also likely end up feeding less organic food to your furry friend as there are often so few fillers contained in it and because nutritional needs are often met with less volume. In the long run, your dog will probably be fitter and fuller from eating organic food. Regardless if your canine companion is currently healthy or dealing with various medical issues, organic dog food truly might be the best medicine for him/her to live a long and happy life. As caring and concerned dog owners, such an end result is often good medicine for us as well.